Couple of week ago, I saw some posted messages not only at CodeProject but also on some other technical database forums; most of the posted message were like "Cannot alter Microsoft SQL Server 2008 Object (design mode)". So I thought that the solution should be shared with you although it's a very effortless way to do. This article is not about sharing some programming ideas / concepts and some excellent code snippets. It's about sharing the necessary settings that you need to change to work in design mode simply as you did in Microsoft SQL Server 2000. As we discussed earlier about the dilemma, actually this is not a problem, but some times it seems to me that it just creates a little panic when working with database object in design mode. 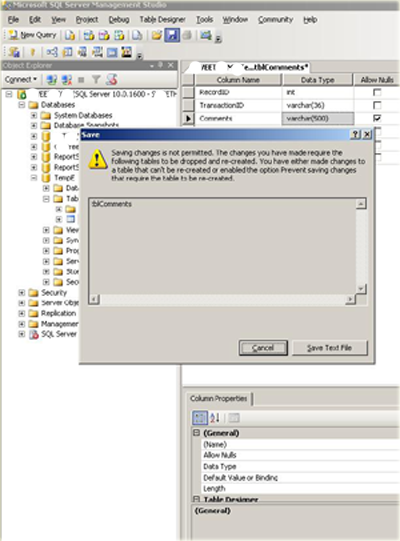 The following figure - A shows the warning message if your SQL Server 2008 has the default settings, and figure - B shows the Option window of SQL Server 2008. Well let’s start….. To change the settings, you need to follow the instructions listed below. Open Microsoft SQL Server 2008, Click on the tools menu and select Options. A window will appear with the various SQL Server settings options. Select the Designers node and after that, click on the Tables and Database Designer sub node. Here you will find some option of a Table. The following figure - B shows the general options of SQL Server database Table object. You will find a checkbox (marked in orange color) named “Prevent saving changes that require table re-creation”. By default, the value of the checkbox is checked. You just need to uncheck the checkbox, that’s all. For more information about the warning message can be found at this link. I hope that this might be helpful to you.